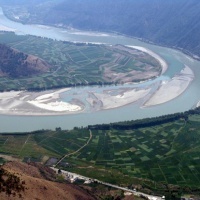 About 51km outside of Lijiang, the Yangtze River makes a sudden V-shaped bend and flow to the northeast. This extraordinary turn, nearly 180 degrees, creates breathtaking views that startle the imagination. 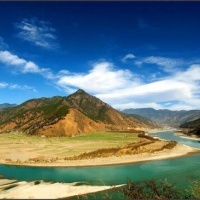 This famous bend is called the First Bend of the Yangtze River. Here, the river is wide and the water flows in a placid pace. It is flanked by lush vegetation and immense steep mountains. 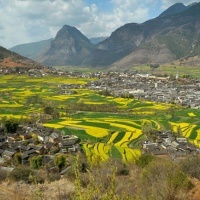 With the gradual deposit of fertile soil at this bend, a village slowly came into being, now called Shigu Town (Stone Drum Town). 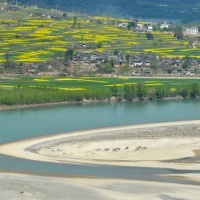 Since ancient times, this town has been important, linking Tibet with the outside world. Here Tibetan people bring their quality fell, hide and herbal medicine and take home tea, salt, cloth and other necessities. When market day comes, the town is incredibly crowded and noisy. The historical Stone Drum Town, together with the First Bend of the Yangtze River, and so many other spots nearby such as the Tiehong Bridge and Rock Gate ensure that a trip here will be an exciting one that you will greatly enjoy. 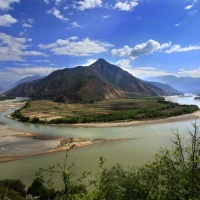 Being a famous attraction nearby Lijiang and not so far from the Tiger Leaping Gorge, the First Bend of the Yangtze River is usually seen in conjunction with it as part of a one day tour. 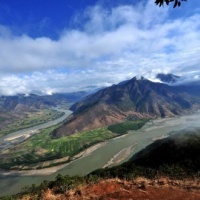 Design and incorporate the First Bend of the Yangtze River into your Yunnan tour here!